The biblical verses Hebrews 12:1 is a guaranty good gifts for runners that love to show their faith while running a 5k, 10K, half or full marathon. Hebrews 12:1 is a perfect biblical quote for runners. Whether you like the "Keep running the race that is set before you with endurance" or the "Let us run with perseverance the race God as set before us." we've got you covered. We have tons of Hebrews 12:1 running accessories and you can also optionally custom create your own marathon gift for runners. Running essentials showcasing your faith and your love for the sport is an amazing gift idea for a runner. 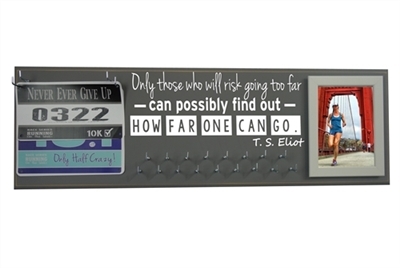 It doesn't matter if you are looking for runners gifts or for marathon gifts, this will surely make a good one! Hebrews 12:1 is our most popular biblical verse for runners and marathon runners. Shop now and enjoy.